On a recent afternoon, Hinsdale’s School of Rock is in full form. Upstairs, a mixture of percussion, amplified vocals, and a snarling reverberation of strings carry down the stairs and walls and lodges itself like a storm cloud under the floorboards; a definitive presence in an otherwise professional setting. Someone is rocking out right now. And chances are they can’t vote or operate a vehicle. That’s because School of Rock—which feels like an institution that would be presided over by Roger Waters—inspires kids, some of them only preschoolers, to pick up instruments with the hopes that they will one day grow comfortable enough to perform in front of hundreds of people. Anisha Advani is one of those talented young musicians. At 14 years old, the Hinsdale Central student can play the piano, flute, and guitar (as well as hit a high note on the microphone). But for Anisha, developing her musical talents is only part of her overall focus. What she really wants to do is incorporate her other major interest—charity work—into playing music with her friends. Anisha, who started coming to School of Rock almost a year ago, brought up that she wanted to play for local charities to Patrick McKenna, Hinsdale School of Rock’s general manager, who immediately wanted to help her out in any way he could. Though Patrick encouraged her to think bigger, he also says Anisha’s energy was contagious. 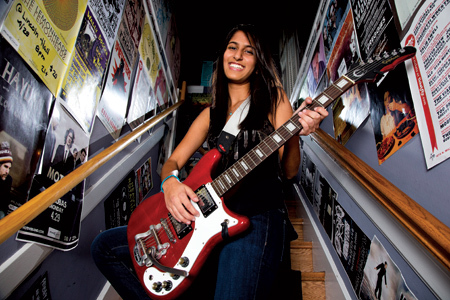 Initially, Anisha wondered if School of Rock’s house band would be willing to perform with her at local charities (such as DuPage PADS, where Anisha has been volunteering making beds and preparing meals for the homeless), as well as hospitals and retirement homes. But with the help of Patrick, finding a venue, creating a marketing campaign, and incorporating massive amounts of logistics were now feasible. “Putting on rock concerts is what we do,” says Patrick. What was once just an idea has now evolved into the Kids Rockin’ for Kids Benefit Concert at Fitz’s Spare Keys on November 8th, featuring performances by not just Hinsdale’s School of Rock, but Naperville’s and Elmhurst’s too. Together, the bands will alternate set lists and play everything from ‘60s classic rock to hit songs on the radio right now, and everything in between. In the film School of Rock, starring a shaggy-haired Jack Black, Jack tells one of his young charges, “One great rock show can change the world.” It is with that same mindset that Anisha has put together her first annual Kids Rockin’ for Kids Benefit Concert, the first production by her not-for-profit, Musicians for Charities. “I created Musicians for Charities to bring together the power of music and compassion of young musicians to help children in need,” says Anisha. Though she won’t be selling tickets, donations are encouraged: all proceeds go to UNICEF while also building awareness for local charities like DuPage PADS, Inspiration Couture, and Nourishing Minds. If she gets a good response, Anisha envisions producing annual performances, even having shows encompass more schools and areas. It’s for these reasons that her energy is being poured into making sure the show comes off as a success, and it’s also the reason she won’t be joining her friends onstage (except to talk about how donations to UNICEF are going to fight the Ebola virus and the other charities’ initiatives). And with the School of Rock’s help, she is able to reach people through email, her organization’s website musicians4charities.org, social media, posters, and handbills. At Hinsdale’s School of Rock, posters of famous musicians plaster the walls leading up the staircase. Though Anisha isn’t counted among them—yet—her message is clear: You don’t need to be famous (or an adult) to change the world. All you need is rock, and a little help from your friends.